On this page you will eventually find information and rules sets for a beta playtest of Sword & Barrow, the 2nd edition of the Adventures in the Known World RPG. As a teaser of the current inhouse rules playtest you can download maps of the region being detailed and explored: the upper reaches of Dain Dania, including the haunted Tiria Wold. 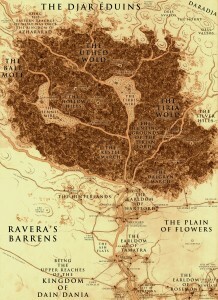 In addition to the map of Upper Dain Dania, you can also download pdfs of maps for the Free City of Newgate, home to one of the Middle Kingdom’s great Universities; the Gyrdiff Region just on the borders of the Tiria Wold; Gyrdiff Castle, home to Lord Naeras, sworn to Earl Geller of Hartford; the Temple of the Hunt, the largest Yheran temple in the area; Penngraile, a ruined castle deep in the Tiria Wold; and the hidden ruins below Penngraile, where foul cultists in the forbidden Nameless Cults lurk. The Beta Playtest will flesh out the region, its major NPCs, and the dangers and tests of the Tiria Wold. More soon!